When one thinks of the work of the United Nations for persons with disabilities, the Convention on the Rights of Persons with Disabilities (CRPD) and its Optional Protocol usually come to mind. Adopted on 13 December 2006 and entered into force on 3 May 2008, the CRPD is the first comprehensive human rights treaty of the 21st century and intended as a human rights instrument with an explicit, social development dimension. It follows decades of work by the United Nations to change attitudes and approaches to persons with disabilities, and takes to a new height the movement of disability rights and further ensures that persons with disabilities become agents of change throughout the world. As of today, there are a total of 175 States parties and 160 signatories to the Convention. 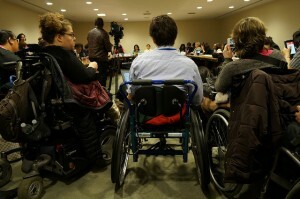 With the adoption of the 2030 Agenda for Sustainable Development in 2015 and series of other globally agreed development frameworks, the United Nations will continue to mainstream disability issues, and advance the rights, perspectives and leaderships of persons with disabilities in all aspects of sustainable development. Since its inception, the United Nations has been a champion for advancing human rights for all, with “universal respect for and observance of human rights” enshrined in the Charter of the United Nations. The 1948 Universal Declaration of Human Rights was among the first steps towards inclusive societies for all, as it included an equalitarian approach that would speak to disability activists, leading them to organize and demand a new perspective on the issue. Nevertheless, at the time, persons with disabilities were still considered as “objects” of charity, medical treatment and social welfare, far from the “subjects” who can claim their rights and be active members of society. 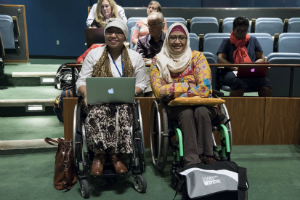 This publication aims to provide an overview of the work of the United Nations, in particular the Secretariat, for persons with disabilities from the commencement of the organization in 1945, to the present, highlighting the major meetings, human rights treaties and milestones that the UN has achieved in its promotion for the rights of persons with disabilities. Retracing how the CRPD came to be, it also showcases the UN’s work towards a more inclusive world throughout the past 70 years and identifies the challenges and opportunities ahead.